Sibaya Casino & Entertainment Kingdom has enhanced its capacity as a host for grand-scale events with its expansive, multipurpose venue, Sun Park. 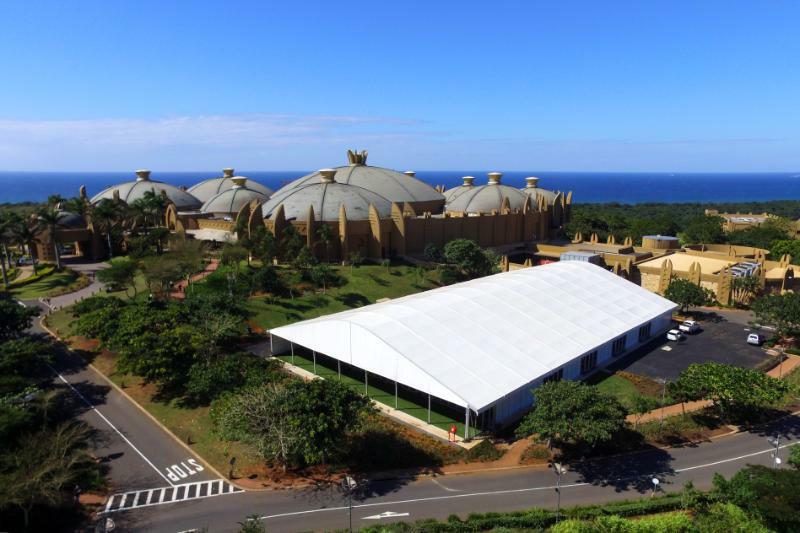 Responding to a growing demand on the North Coast of KwaZulu-Natal for a versatile facility to stage large events, the state of the art Sun Park features semi-permanent flexible infrastructure, built around a sophisticated grid that can be arranged into any configuration. Sibaya’s Sun Park incorporates a marquee structure and deck, offering the facilities and support services of an indoor events venue, with the flexibility of an outdoor space. The Sun Park grid spans 2,400 square metres and the marquee 1,750 square metres. There is also a vast grassed area on the east side of the structure. With Sun Park’s modular design, the customisations are limitless and there is access to all amenities for bringing even the most over-the-top events to life – from food festivals, product launches and banquets to exhibitions, concerts, pageants and other experiences. The infrastructure offers water, electricity, WiFi, an office and storage space. Sun International currently operates three fully-fledged Sun Parks at Sun City (North West); Carnival City (Gauteng) and Sibaya (KwaZulu-Natal). The innovative Sun Park grid has also been laid at GrandWest (Western Cape). It is fully operational however it does not come with a marquee. “Our new multipurpose events venue, Sun Park, is set to become the preferred venue for lifestyle events, exhibitions, conferences, concerts and banquets on the North Coast,” says Melville Vogel, Regional General Manager: Sibaya. “It offers Sibaya a flexible and versatile platform for hosting larger events than has been possible in the past. With this comes the promise of bigger shows and events for our customers and community. Sun Park is at the site of Sibaya’s old staff parking, providing easy and convenient access to the complex and all it has to offer. It is conveniently situated 10 minutes from King Shaka Airport and five minutes from Umhlanga. With expansive views over the warm, Indian Ocean as well as inland views over the beautiful rolling hills of Zululand, guests get the best of nature combined with cutting-edge design and architecture, incorporated into one exciting venue. The vibrant casino floor boasts a wide selection of slots and table games, while the iZulu Theatre stages a myriad of comedy shows, music concerts and other events. There is also a choice of restaurants and bars including the upmarket Aqua Seafood and Royal Court Grill, and the welcoming buffet restaurant, Africa to Asia (also known as A2A). The resort features two quality hotels; the Sibaya Lodge and the luxury Royal Sibaya Hotel, where out-of-town delegates and discerning casino patrons can stay over in beautifully-appointed rooms. Sibaya is also home to the exquisite Mangwanani Sibaya spa where visitors can indulge in a range of rejuvenating treatments and therapies. Recently, Sibaya Casino and Entertainment Kingdom and renowned Gauteng company, Rockwood Theatre confirmed an exciting partnership will see more music shows, revues and stage productions coming to Durban. Rockwood, which has had huge success in Pretoria, is located in the newly renovated 300-seater, supper theatre venue. The venue previously housed Krakatoa Night Club.